So the planner chronicles continue. 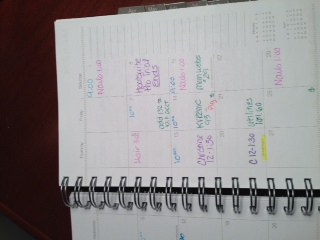 Last time I talked about my planner, I had decided to go with a Martha Stewart Arc planner in a pretty turquoise color. I love that planner. It’s colorful and cute and just the right size. Plus I can add pages as needed or take them out. 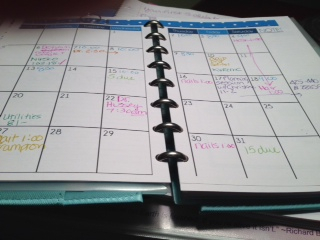 I like that because it keeps the planner down to a manageable size. Then last week I went to see my coach in New Jersey along with other members of her coaching group. One of the things that she pointed out to me was that things don’t get done just because you put them on a to do list. 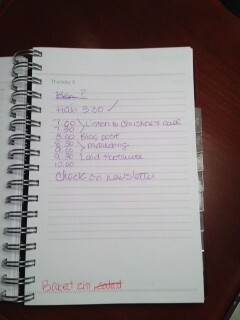 And they don’t always get done if you write them down in your planner for the day without assigning a time to do them. You’re probably saying “duh, Brenda” right now. I mean, I’ve said the same thing myself, lots of times. So how come I wasn’t doing it? Cause I have ADHD and sometimes we need reminders of things we already know. So I decided to buy a new planner once I got home. One that had a page for each day and times in it. Never mind the fact that my pretty turquoise one lets you put pages in and take them out. Never mind the fact that I could print pages for free from the internet that would be colorful and cute and have times on them. No. I needed a new planner. So I went in search of one. It’s kind of like an addiction. The one I found was plain and black. Spiral bound. It had a page for each day, but no times already printed for the days. I’ve been trying to use it for about a week. 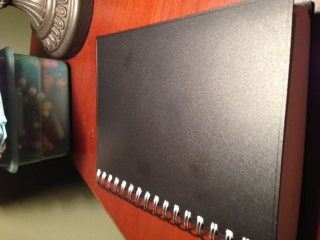 And it’s stupid, cause I wasted ten bucks on it and all I had to do was print some pages for my planner I do like. It’s that impulsive side of my ADHD. So that’s my latest update on the planner thing.